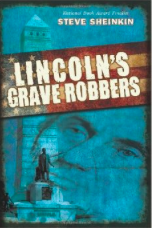 Not only has the author Steven Sheinkin made an exciting book out of Lincoln’s Grave Robbers, but has made the reader appear as if they are standing with the criminals. Lincoln’s Grave Robbers is about a secret service agent named Patrick Tyrell in the 19th century, who is trying to track down counterfeiters. He recently caught one of the best counterfeiters in the Mid-West called Benjamin Boyd. Because of this bust, the counterfeiting business had never been worse, because many people bought the phony money from him. A criminal known as Big Jim, has a plan to keep the business alive. He hires three men to steal the remains of the 16th president of the United States, Abraham Lincoln. However, what Big Jim doesn’t know is that one of his criminals is working for the secret service and is telling Tyrell about the scheme. This book contains events that happened in real life including the robbery and it’s masterminds. This book also gives different perspectives of it’s characters. The back of the book contains an epilogue, a body snatchers bonus section, and a glossary of phrases that would have been used in the 1800’s. The book is an intriguing yet factual read, however it does drift from the main story from time to time. The author uses many words that people would have used in the 1800’s and also shows pictures of the characters in real life. The exciting climax will make you keep reading this book in order to see what is next. This book is excellent historical fiction and I would recommend it to people who enjoy American History and action.